Fall is here in NYC, with perfectly crisp mid 60s temperatures perfect for throwing on a flannel and doing all the fall things – drinking warm cider and PSLs, scoping out foliage and – my personal favorite – apple picking in picturesque orchards. 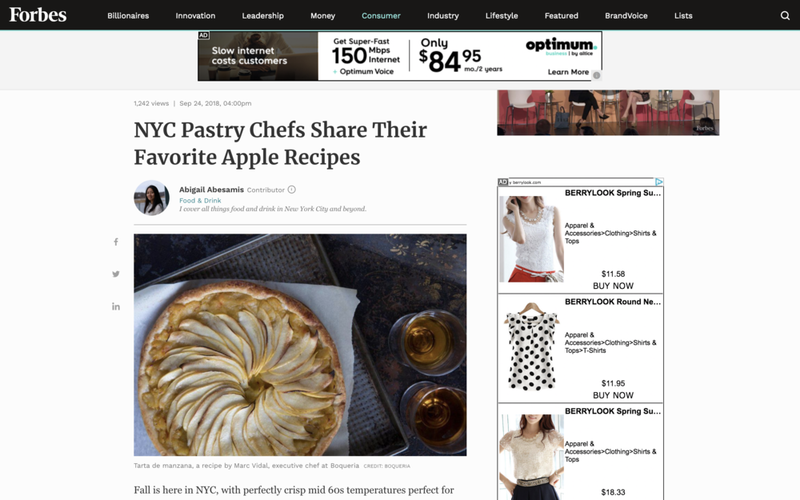 If you’re stumped for what to do with all those apples once you get home, look no further than these recipes crafted by some of NYC’s top pastry chefs. Butler hosts weekly cooking classes after hours at Butler’s recently opened Dumbo location, an intimate event with a maximum of 12 participants where he shows guests how to make a chosen signature menu item. If you’d like some expert guidance, Butler will be adding the crostata to the class rotation beginning in early October. In a medium pan combine all of the ingredients except for the apples and cook on medium heat. Stir until a sauce is formed. Add the apples and cook until they are tender. Cut the butter into small 1/2-inch square pieces. Combine with the sugar and flour (either by hand or with a stand mixer) until pea-sized pieces are formed. Add all the salt and add the water in three stages until a smooth dough is formed. Rest dough in the fridge for 1 hour. Roll the chilled dough with a rolling pin to 1/8-inch thickness. Cut with ring cutters approximately 4 inches in diameter. Bake the crostata discs at 375°F for 10 minutes. Allow to cool. Once cooled shingle the miso toffee apples in a circular pattern on top of the crostata disc. Whip all ingredients together, then set aside in the fridge. Quenelle some of the mascarpone onto the cooled crostata. To quenelle, warm a teaspoon up in warm (not hot) water. Scoop horizontally across the top of the mascarpone then shape it into a cocoon-like horizontal drop with a second spoon, scooping it out for a smooth surface. For brunch, this buzzy Prospect Heights restaurant presents dishes inspired by classic brunch flavors, from breakfast egg rolls filled with housemade bacon and Vermont Cheddar to potato latkes topped with preserved lemon creme fraiche and smoked trout roe. Also on the menu are these apple strudel sticky buns, with milk jam poured over top as it reaches the table. The recipe was crafted by Alex Grunert, a longtime friend of chef-owner Greg Baxtrom and a fellow Blue Hill at Stone Barns vet (where the two met). Grunert’s sticky buns are a nod to a classic Austrian apple strudel. Both Baxtrom’s father and Grunert are from Austria, hence the inspiration. Mix apples with sugar, cinnamon, walnuts and rum raisins. Macerate mix for 1 hour, then mix in breadcrumbs. Add breadcrumbs, sugar and vanilla bean, and roast until the sugar starts to caramelize and the breadcrumbs are beginning to smell aromatic. Work carefully – this mix burns easily. Bring water to a boil, then add golden raisins and blanch for about 10 seconds. Press the raisins into a plastic container and fill it with dark rum until the raisins are covered. Refrigerate for about 3 days before use. Add the flours, sugar, salt and eggs to a mixing bowl and start mixing with dough hook. Mix on low speed for 4-5 minutes until the ingredients come together. Once the dough looks “dry” add in the butter and mix until it is incorporated. Once incorporated, mix on a higher speed for up to 15 minutes. Mix until the dough looks silky, then scrape it into a bowl, cover with plastic and rest in the refrigerator for at least 6 hours. Melt butter in a pan, then add sugar and whisk until the sugar is dissolved. Add honey, heavy cream, water and salt, then cool the mixture down to room temperature. Cut dough in half, spread on the apple filling and roll into sticky bun shape. Press and bring in shape. Cut into 4 1/2-centimeter pieces and place into greased mold. Freeze, and when needed, defrost and proof. Pour 2 ounces of syrup onto strudel and bake at 350°F for 18-22 minutes. Bring everything to a boil and stir from time to time as the mix burns easily. Reduce the mixture until it turns into a thicker brown consistency. It will break and get grainy at the end. Blend, strain and pour mixture into a bowl. Cover bowl with plastic and allow mixture to cool down in the refrigerator. Rubin describes these doughnuts as “a grown-up version of a nostalgic favorite.” She recounts visiting apple orchards in Michigan while growing up, picking apples and ending the day with a warm apple cider doughnut covered in cinnamon sugar – a sweet ending to a fun trip. “This donut recipe has a lot of apple flavor from the reduced cider and grated apple, as well as a pleasant nuttiness from the addition of brown butter,” she notes. In a sauce pot, bring apple cider to a boil. Reduce it until it measures 1 1/4 cup. Set aside to cool to room temperature. Mix cake flour, baking powder, cinnamon, ground nutmeg and salt together. Whisk yeast, milk, buttermilk, egg, egg yolks, lemon zest, sugar, dark brown sugar and browned butter together with the reduced apple cider. Peel and grate the apples. Squeeze out as much liquid as possible using paper towels. Mix apples into the apple cider mixture, then add the dry ingredients. Pour the dough out onto a floured surface and roll out to 1/2-inch thickness. Shape doughnuts using a 3-inch circle cutter and place them on a baking sheet. Combine the remaining scraps of dough and cut more doughnuts. Using a 1-inch circle cutter, cut holes to create a doughnut shape. Freeze the cut doughnuts while the oil heats up. about 1/3 full. Heat vegetable oil to 350°F. When the oil reaches 350°F, fry the doughnuts for two minutes per side. Place doughnuts onto paper towels to absorb the excess grease. Let cool until you can handle them and toss in cinnamon sugar. Chef Vidal makes his own puff pastries throughout the year, topping them with peaches and lavender cream in the summer and saffron-scented apples in fall and winter, but you can get away with using store-bought puff for at-home baking. Simple, but full of warming apple and saffron flavor, Vidal’s tarta de manzana is the perfect fall dessert where seasonal flavors meet Spanish cuisine in true Boqueria fashion. Peel, quarter, core and thinly slice two of the apples. Put them in a medium saucepan, along with the butter, saffron, 1 tablespoon sugar and 3 tablespoons water. Cover and cook over medium heat, stirring occasionally until the mixture is dry, about 18 minutes. Blend mixture on high speed until very smooth. Cool completely. On a lightly floured surface, roll the puff pastry into a 10-inch square. Place a 9 1/2-inch diameter dinner plate on the pastry and cut around it. Discard the scraps or reserve for another use. Place the pastry circle on a parchment paper-lined baking sheet. Using an apple corer, remove the core from the remaining apple, then cut each half into scant 1/16-inch thick slices. If you have a mandoline, use it for this. Spread the cooled apple purée over the pastry, leaving a 1/2-inch rim. Fan the sliced apple over the purée in slightly overlapping circles. Sprinkle the remaining 2 tablespoons sugar over the sliced apple. Bake until the pastry is golden brown and the apples on top are tender and caramelized, about 45 minutes. Cool slightly, then sprinkle the apples with more sugar to coat lightly. Use a blowtorch to caramelize the sugar on top. Caramelize 800 grams of sugar until nicely golden. Deglaze with the hot water. Add in the diced apple and cook until tender. Strain and keep the apple and syrup separate. Dry caramelize 600 grams of sugar. Boil apple caramel liquid and add in the pectin mixed with 40 grams of sugar. Use this to deglaze the caramel. Add in the apples and bring back to a boil, stirring well. Set in a demi sphere mold to freeze before glazing. When plating, remove from mold and glaze with clear mirror glaze. Mix the butter with the icing sugar and salt, stirring well. Mix the almond meal, cinnamon and custard powder. Add to the icing sugar mixture. Add in the eggs one at a time, cleaning the bowl down well after each addition. Add the rum and mix until homogeneous. Mix the butter with both sugars until well combined. Add oil and scrape bowl down. Add lemon and orange oil. Add both flours and salt and mix until just combined. Bake off in crumbs at 150°C for 12 minutes. Soak gelatin leaf in cold water until rehydrated. Bring cream to a boil and pour over the white chocolate and glucose. Mix well then add the gelatin. Blitz mixture and reserve in the fridge. Slice brioche into single squares. Pipe cinnamon almond cream onto the toast. Bake in the oven at 160°C for approximately 12 minutes or until nicely colored. Invert frozen apple pie filling onto the cooled toast. Pipe white chocolate chantilly on each corner and arrange small pieces of crumble around the cream. Leave out for 20 minutes before serving.